Rimless eyeglasses are a tried-and-tested look and an eyewear staple that has maintained it place in the optical wear market for many years. As with most fashion accessories, the number of frames and designs in prescription glasses has increased dramatically over the last few years, with no sign of slowing down.With rimless eyeglasses, you can have a different style every day, whether you use them for fashion or with a prescription. This is mainly due to their low price and high durability, which describes these titanium eyeglasses by Agstum perfectly. Let’s take a look at what else these glasses have to offer. These stylish, sophisticated rimless eyeglasses are perfect for anyone. Whether you have a strong prescription or just want to wear a pair of stylish glasses, these specs by Agstum have everything you need. They are subtle, trendy and durable, not to mention very lightweight and comfortable – everything you could want in eyeglasses. This product is primarily advertised for men but is just as suitable for women who are looking for a sleek and stylish pair of glasses that won’t weigh them down. These glasses are also great for businesspeople. 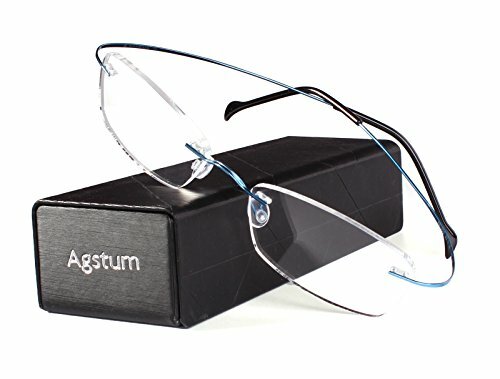 The Agstum Frameless eyeglasses come with a soft cleaning cloth and a glasses case to keep your new specs safe and scratch-free. The glasses are durable and bendable, so you’re very unlikely to break them. The frame is made from titanium, which is sturdy and strong. The lenses are plastic and non-polarized, making them great for any user.A choice of lens widths is available (52 and 55 millimeters), and the width is adjustable so you can choose a pair that suits you best. The lens height is 31 millimeters, which suits most people’s faces.The bridge is 18 millimeters, which is ideal for most noses. The flexible arms are 140 millimeters, which makes them great for adults who do not wear glasses all day long but still want to be able to carry their specs with them. These glasses have been designed to look sleek and stylish for both men and women, and are excellent for use at home or work, especially if you are expected to look smartly dressed and fashionable.The titanium frame is super light, so you can barely feel them when you wear them, making them extra comfortable. Not only do they provide one of the coziest fits available, they also boast unparalleled durability that you will appreciate as it will save you time and money in the long term.You can also change the plastic lenses for your prescription lenses at your optometrist’s office if you prefer – these glasses are ideal for this purpose. These glasses boast a lifetime warranty on the titanium frames as well as a 30-day money-back guarantee if you are not completely satisfied. These glasses are very simple to use. Simply find the correct width for your face, adjust them to suit this width and then place the arms behind your ears and the nose pads on the bridge of your nose to check that they are comfortable. They should feel light and comfortable. These eyeglasses have a durable titanium frame and plastic, non-polarized lenses with a width of either 51 or 55 millimeters. These glasses are best suited for those with a narrow to medium head size.The glasses come with a hard protective case as well as a microfiber cleaning cloth. There aren’t any hinges at the temples, with the arms simply bending to go over your ears.These eyeglasses are very comfortable and lightweight. Plus, their very reasonable price under $20 makes them well worth the money. These imported glasses have a titanium frame and composite, non-polarized lenses with a width of 52 millimeters. They are very lightweight, weighing only 9 grams. They are hypoallergenic, ensuring that even those with sensitive skin can wear them. They come along with a microfiber cleaning cloth and protective storage pouch. They are also resistant to corrosion cause by acids found on your skin. They cost less than $20 and are available in four different colors..
Whatever your reason for choosing to wear rimless glasses, you can’t deny that they are a hot eyewear trend. These Agstum glasses have a sophisticated frame with a chic and attractive style. They are also very durable, reliable and comfortable, offering you plenty of benefits.The minimalist appearance makes them perfect for men or women, no matter what outfit or color you are wearing.